In the South Carolina Lowcountry, there are 5o to 70 days with thunderstorms every year. The lightning that is produced during these storms can damage or destroy mature trees in our landscapes. These specimen trees are important components of the gardens, golf courses and parks of Charleston. Well-developed trees, especially Live Oaks, add shade, unmatched beauty and value to a property. In fact, many homes and landscapes are built around existing grand oaks and would be significantly impacted if a tree was lost during a thunderstorm or hurricane. 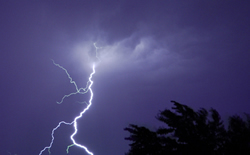 One lightning strike to a tree can cause a tremendous about of damage or complete death. When lightning hits a tree, the electrical current moves down the branches and trunk and heats the water within the tree into steam. This steam causes the affected areas to explode and often the tree will instantly splinter. Trees that are injured by lightning are more vulnerable to insects like termites and borers. For example, the Southern Pine Beetle is more likely to infest a storm-damaged pine than a healthy pine. Additionally, trees with lightning-injury are liabilities in the landscape because they are more likely to develop heart rot and dieback caused by invading fungi. Lightning-damaged trees are a liability in the landscape because they are more likely to drop branches or fall. The expense of removing a tree that has been struck by lightning is often more expensive than the cost of a Lightning Protection System (LPS). If you have a specimen tree in your landscape that adds aesthetic or historical value to your home, lightning protection should be considered. The Standard for the Installation of Lightning Protection (National Fire Protection Program) states that trees “within 10 feet of a structure, are taller than the adjacent structure or with limbs overhanging the structure” should be protected to manage risk. Tall trees in open areas or on hills are frequent targets for lightning strikes as well. Certain types of trees are more likely to be struck by lightning, including Ash, Black Locust, Hemlock, Oak, Pine and Tulip Poplar. Damage from lightning can be prevented using a Lightning Protection System. This system safely handles the strike and conducts the electrical energy to the earth. The electrical energy is neutralized as it passes down the ground rod. It does not attract lightning- it simply intercepts the lightning bold between the cloud and the tree. Lightning Protection Systems have been in use since the 1800’s and are used to protect trees in many historic landmarks and estates. Most golf courses protect tall trees with LPS to reduce risk to golfers in open areas. And homeowners install LPS to not only prevent tree injury, but to protect their houses and families. These systems can last for over 50 years with periodic inspections and maintenance. Only a certified arborist is trained to properly install this system to ensure the health of your trees and will check the system during routine pruning, trimming and maintenance visits. Properly installed systems are fairly inconspicuous and do not cause injury to trees. Air terminals (sometimes called “lightning rods”) are installed in the top part of the tree throughout the canopy. These air terminals are connected to a ground rod using copper cable that runs along the branches and trunk of the tree. All of the components are manufactured from copper, copper alloys or bronze alloys which safely ground a lightning strike.